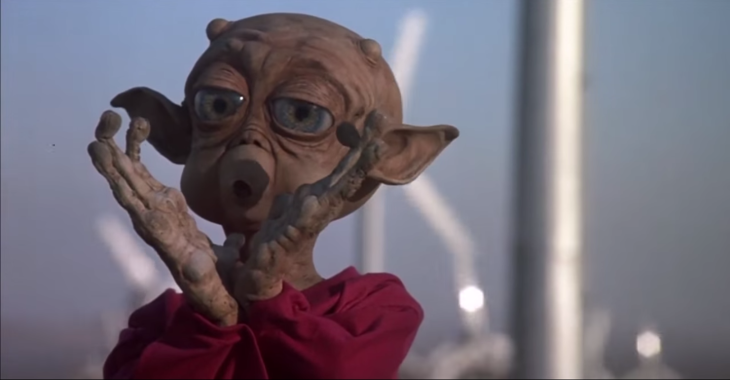 While critics of the time panned almost every aspect of the Mac and Me, the most common complaint amongst the sea of bile directed towards this cinematic monstrosity was the ludicrous amount of painfully obvious product placement it contained. Particular attention was drawn to the inexplicable amount of screen-time dedicated to both Coca-Cola and McDonald’s, which are prominently featured in almost every key scene in the entire movie. This brings us to the product placement. For starters, one of the trailers for the film started with a direct message from Ronald McDonald who is shown reading a copy of the script which is the same color scheme as his outfit. Ronald also featured heavily in commercials and posters for the film, in some cases only having his billing preceded by the logo for the company that produced the film. Ronald also briefly appears in the film’s most infamous scene, which features an impromptu almost 10 minute long choreographed breakdance featuring dozens of dancers inside and around a McDonald’s restaurant that is never adequately explained. This continues even as the plot unfolds around the dancers who are oblivious to the government stooges chasing a boy and his alien friend disguised in a teddy bear outfit. But we’re not done yet- as if having about 10% of the film’s runtime spent inside a McDonald’s full of people exuberantly dancing wasn’t overt enough, the film also features a main character who works at McDonald’s and wears her uniform in every scene she appears in, most of which she wasn’t at work for. That’s not to mention the Oscar-worthy dialogue in which the family discusses how incredibly good Big Macs are. As for Coca-Cola, along with being prominently featured in several scenes, either in characters’ hands or handily placed McDonald’s cups, it ends up being a key plot point later in the movie when the main character uses it to revive Mac’s ailing alien parents. Yes, this movie features a scene in which a character is shown bringing someone back to life by pouring Coca-Cola into their dying mouth. This is then immediately followed by a scene showing the same aliens risking detection to buy more Coca-Cola. Coca-Cola, along with Skittles are also the only things the eponymous Mac is shown to consume, with the latter being used to lure him out of hiding like a grotesque parody of the Reece’s Pieces scene in E.T. The film also features a rather prominent plug for the department store Sears, when it is revealed the main character’s mother relocated her entire family to another state because she was offered a job there. Mac and Me? That was another movie where somebody called me up and he was a producer who had worked on quite a few films. He’d made a lot of big movies, but he decided he want to make his own movie. And he raised the money from one of the main partners at McDonalds—I think, like, the produce provider for McDonalds—and he put up the money to do that movie with the understanding that the proceeds from that movie would go to the Ronald McDonald Foundation. Yeah, so I’d go and lock myself in a hotel on Friday night, write ’til Monday, anticipate what the locations were going to be, go out and find the locations, design the aliens and all that stuff. It was kind of a messy way to make a movie. One thing we can say for certain though is that although this movie has been rightly panned and called one of the worst movies of all time, it does feature a silver lining- Jade Calegory, the actor who played the main character, Eric Cruise. Now for most actors this role would have been an embarrassing footnote they’d rather not discuss. (Fun fact: this movie was the first one Jennifer Aniston was ever in.) For Calegory, though, it was one of the defining moments in his young life, because, like his character, he too is disabled, having been born with spina bifida. Why is this important? Well, to begin with, disabled characters in Hollywood films are almost always played by people who have no such disability, and this was even more so the case in the 1980s. But far more importantly, the film never makes a big deal about the character’s handicap. It isn’t an integral part of his character or plot and it isn’t played for laughs or sympathy; he’s refreshingly, and very purposefully, portrayed as just a normal kid doing otherwise normal things until he encounters his little alien friend. The fact that he’s in a wheelchair isn’t even commented on by any character in the movie. While in a perfect world this shouldn’t be notable in any way, as noted in a LA Times article from the time of the film’s release, this was (and still is) a huge deal because it marked one of the exceptionally few times in film history where a disabled actor had secured a role for a character that wasn’t “written disabled” and didn’t have the disability made into a defining character trait or plot element. Fitting then that in Mac and Me they found a boy, Calegory, who’d never acted before at the time and whose only real qualifications for the role was that he was a kid who had a disability, but was otherwise pretty much like any other young boy- exactly the message they were going for. Speaking of this, according to his mother, among Calegory’s many other childhood exploits, when he was five years old and literally only a few minutes out of the hospital after surgery and still in a full body cast, she turned her back on him for just a moment… only to turn back to find him flying by precariously perched spread-eagle on a skateboard he’d found somewhere. You shouldn’t dwell on what you can’t do. Focus on what you can do. And the more you see what you can do, the more you come to realize there are no limitations in life. In a 1988 interview, a then 12-year-old Jade Calegory revealed that he’d gotten so sick of answering the question “Why are you in a wheelchair” that his stock response was to look the person asking in the eye and say “Vietnam”. Why is David Ortiz shilling for the frou-frou beverage? you know that is important because it’s a lot different playing someone who is in a wheelchair than actually being in a wheelchair. And believe me disabled people can tell the difference. The song in the credits of the film “Take Me, I’ll Follow You” actually hints at his disability, while the actual film doesn’t focus on it. I found that weird.